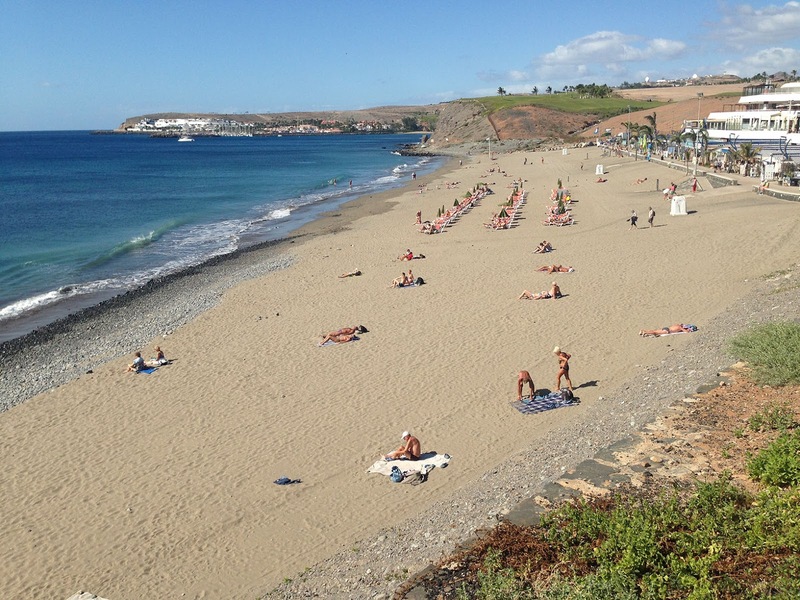 Gran Canaria's Maspalomas is Playa del Ingles' classier sister city. 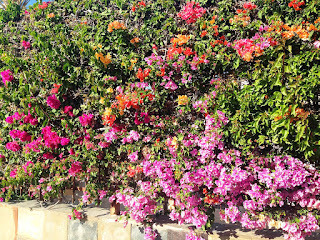 It's in a flat area wedged between the big coastal sand dune and tourist mess of Playa del Ingles on the east side, and the hills to the west. The dunes put you into the most unspoiled nature, but when the trade-winds get blowing, you'll be getting a lot of sand in your eyes. 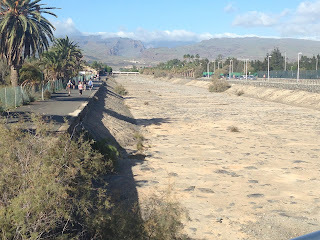 This route follows the Barranco de Fataga, a normally-dry river bed that has been channelized through town: straight like a canal and paved with big stones. It follows a straight-line south to the beach at the Maspalomas lighthouse (where you can turn around to have a 6-kilometer run) or continue running westwards along the coastal promenade towards nearby Meloneras for the full 10-kilometer run. Most of the hotel- and bungalow-developments stride the barranco, so the route is convenient for most people staying in the area. 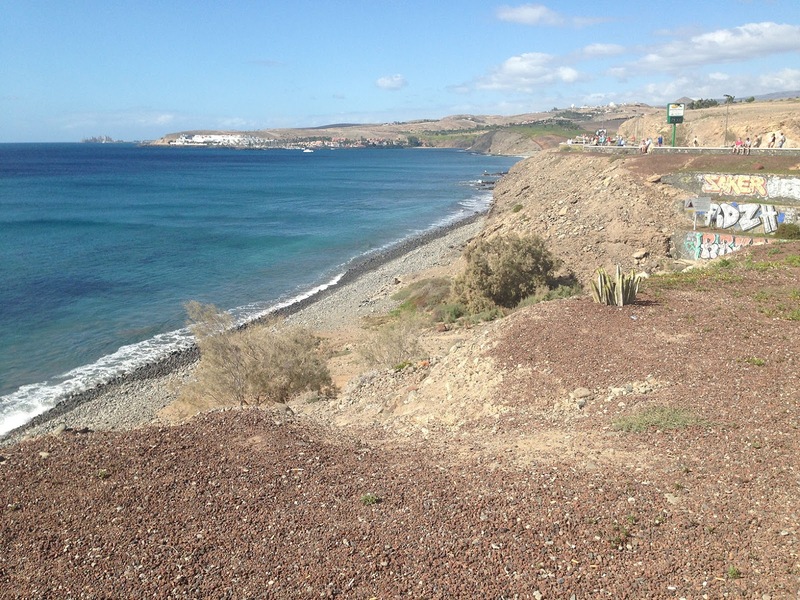 The barranco is lined by pedestrian trails to either side. 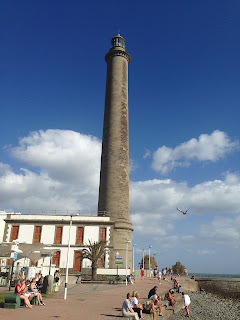 But only the trail on the western side goes all the way to the sea, to the Maspalomas lighthouse, so that's the one this route will take. You could start the run further north, in the city sports complex (adding a kilometer to the run), but we'll start this at an easily identifiable landmark: the ferris wheel at Avenida Touroperador Tui, where it crosses the barranco. So if you're ready to head to the beach, get yourself to the ferris wheel, and cross the bridge on Avenida Touroperador Tui. 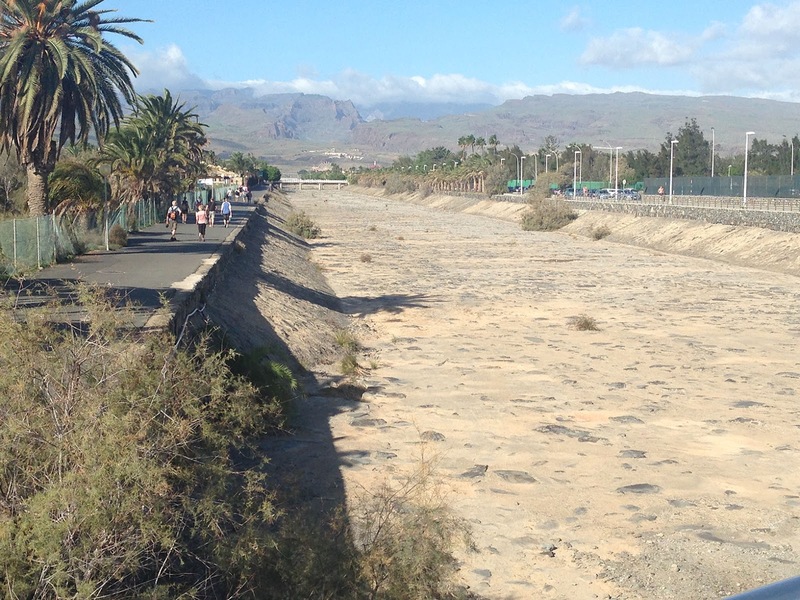 Turn your back to the hills and get onto the pedestrian trail along the barranco, with the dry riverbed to your left. The route is simple: just keep heading south to the sea. The trail is only interrupted once where another barranco joins in from the west. You then have to cross a little pedestrian bridge to continue southwards. Luckily, the west riverbank trail is paved the whole way. 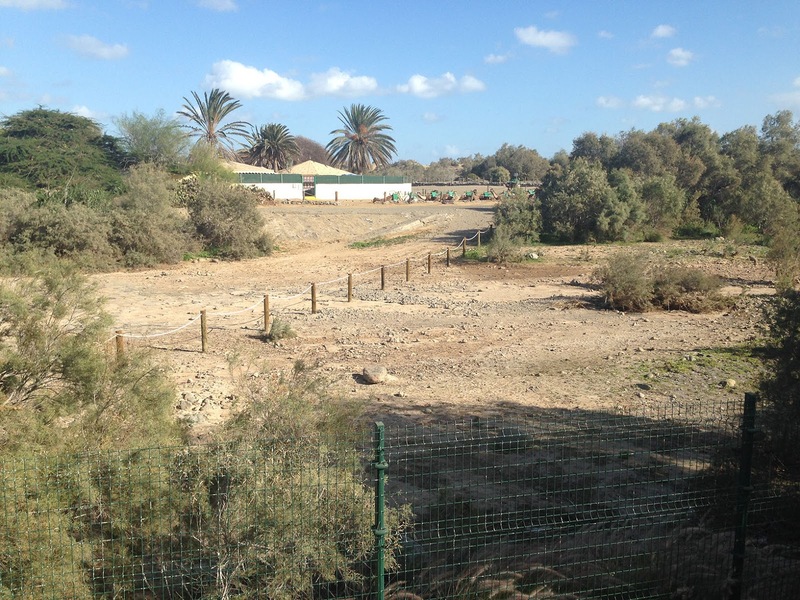 At first, you'll be running by one hotel development after another in the Campo de Maspalomas, on both sides of the river. 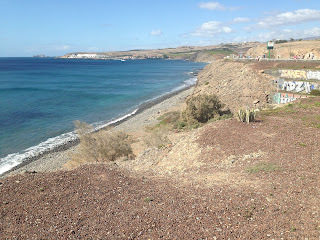 After the Dunas Suites hotel on the right side, there are no more hotels, just nature till you hit the lighthouse area. There are only fields on the west side, to the right, and the giant dune across the riverbed, on the left. At the 2-kilometer mark, you'll pass the camel-tour station on the left, on the edge of the dunes. 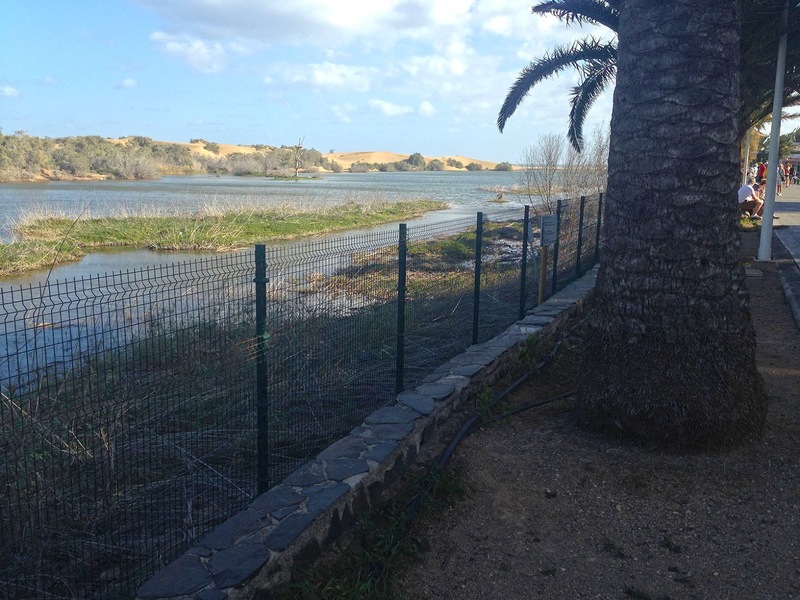 Before you get to the lighthouse, you'll run past the bus stops, at the beginning of the lagoon, La Charca. Herons and egrets wade along the reeds on the other side of the lagoon, and the dunes loom above it. From here till past the lighthouse, the trail will be crowded with tourists if you are not running in the mornings or evenings. The trail curves along the lagoon and comes to my least favorite part of the run: the tourist bazaar. 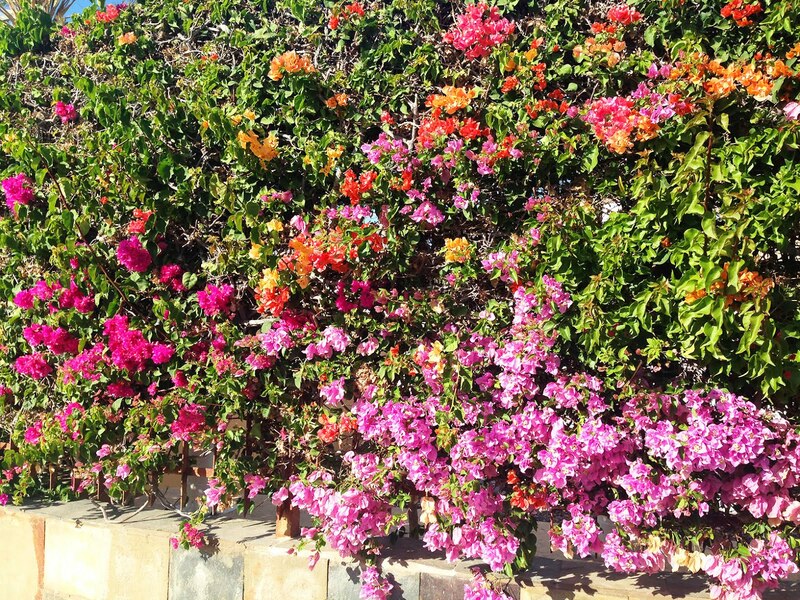 The trail takes you to the right, where you enter the narrow, crowded bazaar-like pedestrian street, Paseo del Faro. The street will probably be fairly packed with shopping tourists, so you might have to walk this part, but it's only 100 meters long. At about the 3.3-km mark, you come out onto a square, with the lighthouse off to the left. Now head to the lighthouse, where you join the pedestrian promenade at the water's edge. Turn right and keep running westwards, with the sea to your left side. The first part of the promenade is pretty crowded as well, but later it thins out. This is where all the four-star hotels are located, some with giant pool landscapes bordering the promenade. 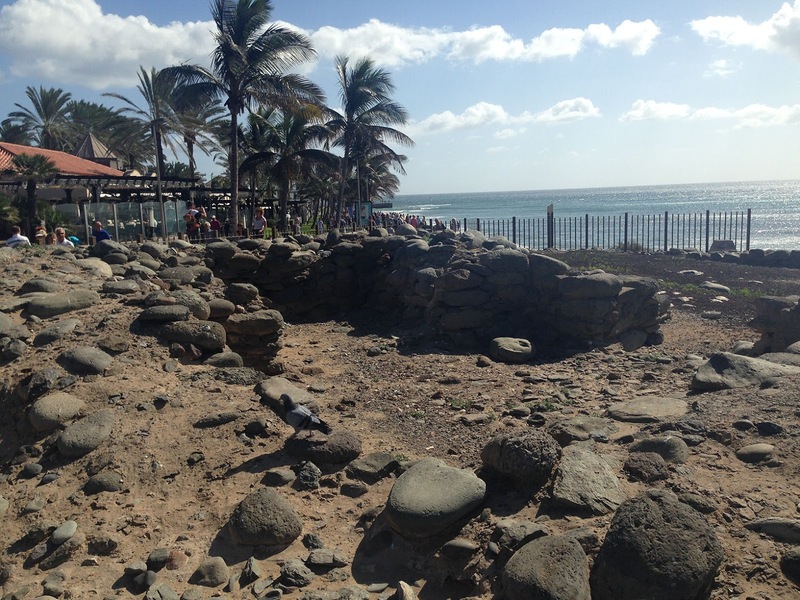 There's also a spot with some stone ruins of a coastal house built by the island natives, from before the Spanish conquest of the Canary Islands. Look out for the big lizards that sun-bathe on the stones. You can see the rocky coastline westwards for many kilometers in the distance. 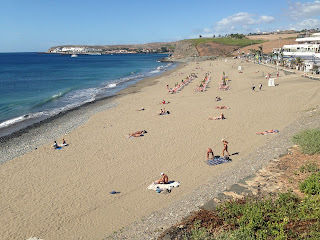 There is Meloneras beach, then a golf course, then a marina. And far away you can see the cement factory, which -- with a little fantasy -- looks a bit like a fairy-tale castle. Well, fairy tales or not, castles are more appealing than cement factories, so that's the way I like to imagine it. When you pass the last of the hotels, you'll see the open fields of Meloneras, or what is still left of them before they get built upon. Meloneras gets its name from the former melon fields that once stood here. There is still one melon farm in the area as of this writing. At the 5-km mark, there is a little restaurant-and shopping area above the beach, which is the turn-around spot for the run. So now just head back home the same way that you came. Excellent run. Just what I needed. Thanks for writing it up.